EXPANDABLE 100ft HOSE is the lightweight, very durable professional grade garden hose perfect for your home or business. When empty it's light and easy to curl up and store in the included storage bag. When in use it expands to 3 times its size and a full 100 feet. 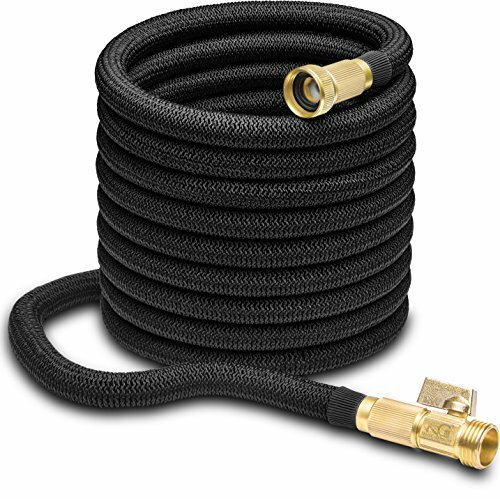 This will reach the far corners of most lawns and gardens allowing many homes to own just this one hose that serves well for all their needs. Brass gaskets give you a no-leak connection that won't rust or corrode. EXTRA STRONG DOUBLE LAYER LATEX makes this the advanced flexible hose that will work well for years without the cracks, tears, splits, and leaks that plague lesser hoses. Even with the heavy duty design, this water hose is light and easy to move. When not in use it contracts making it easy to curl up and store. Our company is experienced in garden hose production. We make every effort to bring you the highest quality products you can depend on year after year. Optimal temperature for use is 5 to 45 degrees C.
Make sure water pressure is in the normal range of 3 to 6 bars. Store in the shade or keep covered. Always drain water from hose when not in use. Do not walk on hose when expanded and full of water. 100 FOOT EXPANDING WATER HOSE for yard and garden. Very flexible expandable hose up to 3 times in length. Just right for reaching your entire property with just one hose. SUPER DURABLE DOUBLE LATEX inside is very strong. The outside is tough 3750D Polyester fabric. This hose won't crack, break, split or crush under normal conditions. You can expect to get great service from this hose for years to come. BONUS COVER is great for storing this premium quality flexible hose during the off season. Also helpful for transporting the hose to another location. We include 4 brass gaskets so you get a secure no-leak connection every time. These won't rust or corrode. COMPACT AND LIGHT WEIGHT making it easy to carry or drag from one part of your yard to the next. When not in use, the hose contracts to 1/3 its in-use maximum length. Very convenient to curl and store out of the way. 100% MONEY BACK GUARANTEE ensures this will quickly become your favorite no-risk purchase. Many people are stocking up with 2 or 3 of these premium garden hoses to use all over their property. HURRY AND BUY NOW while we have a this very popular garden hose in plentiful supply. Makes a great birthday gift or holiday present. Wonderful for friends, family, and co-workers. If you have any questions about this product by Nifty Grower, contact us by completing and submitting the form below. If you are looking for a specif part number, please include it with your message.